from the bridge of the San Aotea II. This is my first (ever) blog so I beg the reader’s indulgence – I’m feeling my way. As I write this early morning I am having trouble seeing the computer terminal due to bright sunshine. You learn quickly down here that 24 hours of sunlight comes with a hitch – the sun is always quite low on the horizon – very much like driving a car just after sunrise in the winter. On fine days the glare is more hindrance than asset. Looking out the bridge windows now I can see the Ross Ice Shelf (also known as the Ross Barrier) framed by a pale blue cloudless sky and stretching in front of me right across the horizon from east to west. I sometimes wonder what James Clark Ross must've thought when he first came up against it in 1841 – it's nearly 50 metres high and stretches east 455 nautical miles from Cape Crozier on Ross Island, completely blocking his further progress south. You cannot go further south than here by sea. As I look it’s a dazzling white ribbon with the sun contrasting and shadowing all the irregularities - caves, crannies, and bulges. The Ross Ice Shelf is where many of the southern hemisphere bergs are calved and out to starboard there is a new berg about four miles long. Flat-topped and pristine white it’s the definitive and unique southern hemisphere tabular berg – and I’ve got a great view of it from my ‘office’. 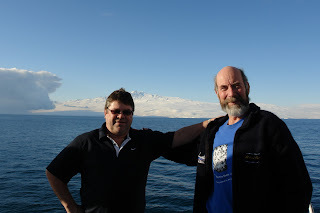 Me (left) and Peter Weeks the skipper of the Aotea II. That's Mt Erebus in the background. So, who am I and why am I writing this? When asked, I define myself a marine science specialist -having spent much of the last forty-one years working at sea. I worked for Government agencies for just over 20 years in the disciplines of fishing gear technology, exploratory fishing, and then running research surveys mainly for stock assessment. Then I changed tack in the early 1990’s and spent a number of years as a fillet- boat processing manager for Sanford and moving to a diverse range of fishing related work . Now I’ve come full circle and am again taking up some research work as an independent consultancy – mainly this time on Antarctic fisheries . This started in the Ross Sea where I have spent every summer since early 2001 contracting to Sanford. Among other things I supervised the research carried out aboard. The scope then widened to encompass the South Atlantic fisheries at South Georgia and the South Sandwich Islands. Over the past seven years I have attended annual CCAMLR Meetings as a member of the Fish Stocks Working Group and as an advisor to the New Zealand delegation to the Scientific Committee. I have written or co-authored a number of scientific papers chiefly on Antarctic toothfish biology, feeding, sea-bird mortality mitigation, and the long-line fishing methods used in Antarctic fisheries. I feel very privileged to be able to take part in the Our Far South voyage. For those of you who don't know, it's a project where a group of New Zealanders from a wide range of backgrounds travel together to Antarctica and the sub Antarctic Islands to investigate the issues facing the region. Due to commitments and timing I will join them when they get down here in about a week and a half depending on weather. Where am I? 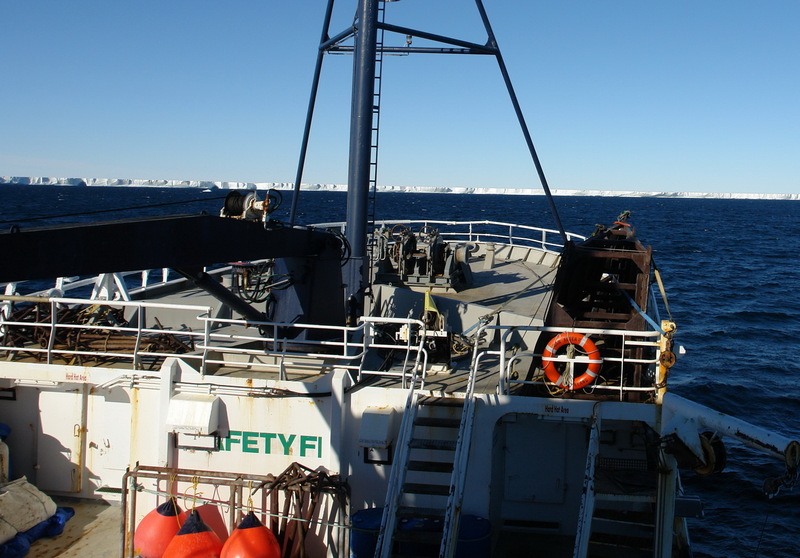 Aboard San Aotea II - one of Sanford’s longline vessels in the Ross Sea carrying out a research survey on small toothfish at the very south of the Ross Sea. More on the survey, CCAMLR and the boat next few blogs. I'm an independent marine science specialist who has spent much of the last 40 years at sea in a variety of roles. I currently do marine research as an independent consultancy, mainly in the Antarctic fisheries.